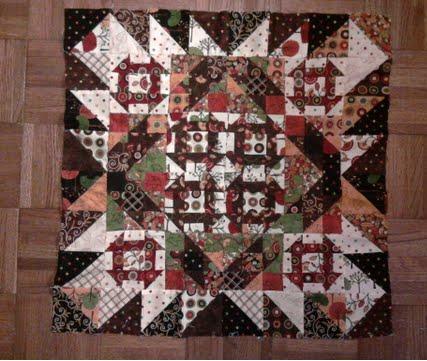 Quilting Fun: Mini Churndash is Finished!!! I am so excited that I finished my second Le Petite project. I love having a challenge. It keeps me motivated. If I had just decided to do a small project every month for myself, I would probably find other things to do and let myself off the hook. Doing it with others out in blogland keeps me accountable and encourages me to continue. I am very happy with the outcome of this project, although I wasn't so sure about halfway through. 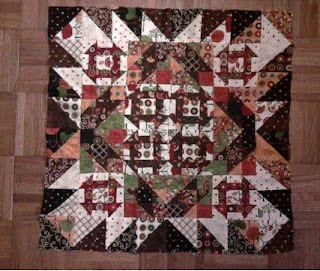 I tend to be drawn to large graphics in my fabric choices and while I feel this would have looked better with smaller scale prints, I do like the colors and the overall finihed appearance with this small quilt. this is absolutely lovely...how big is it?